Whether this is your first year to play or you’re a scratch golfer, you can find the challenges and excitement you want on our more than 50 public courses. With a backdrop of morning mist to crimson-gold sunset, you can experience the power of a long drive soaring across lush fairways or the thrill of a match-clinching putt. You can get tee times that fit your schedule. And our courses offer a great value for an outstanding level of play. You can also find amenities that will bring you back: friendly staff, comfortable clubhouses, pros who can help you improve your swing, mouthwatering cuisine, refreshing drinks, pro shops and a choice of nearby lodgings ranging from wooded retreats to luxury hotels. 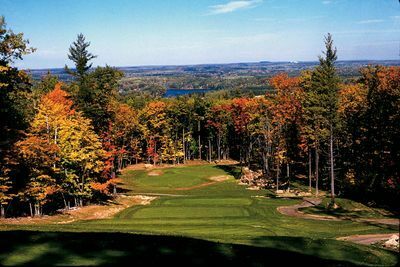 But what sets our 5-Star Wilderness® courses apart from others in the Midwest is the stunning U.P. beauty that surrounds you, from blossoming spring to deep verdant-green summer to brilliant autumn. Come golf where Nature relishes each day.